Whoever said “Size matters” probably wasn’t a digital photographer, but if he had been, he would have still been quite correct. When packing for a trip, the fewer digital media cards you can get by with, the better off you are. If you are shopping Lexar media for your next trip, you are in luck. With capacities constantly increasing, it’s now possible to pack 32 GB of picture taking ability into one compact flash card. If your camera takes SD cards, the ante is raised to 128 GB, unless you are lucky enough to have one of the new breed of cameras with dual SD slots, in which case you are able to pack a quarter terabyte. Bizarre. To put it in perspective, one 128 GB SDXC card will hold a full 48 hours of hi-def 1080p video goodness. In the Lexar brand, you’ll be able to find SDXC cards up to 128 GB and SDHC cards up to 32GB. In compact flash and in memory stick pro duo cards, Lexar offers up to 32 GB. Before you run out and buy a SDXC card, make sure your camera or videocam supports it. Usually, only the very latest do. 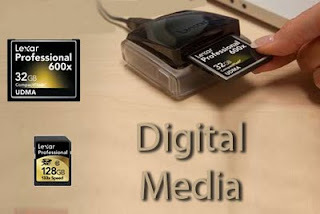 Take the latest version of 600x UDMA compact flash cards which I recently used in my Nikon D300S. While in the Caribbean this year, I had the chance to shoot the Royal Clipper, which is the world’s largest, true clipper ship, under full sail as it left St. Kitts. There would only be a few minutes while my small skiff could keep up with the larger sailing ship, so every second counted when the shooting started. Just holding my finger firmly down on the shutter and not letting up, I was able to shoot almost 40 more photos per minute using the Lexar 600X card. Whether you are cutting through the waves on the Atlantic, or shooting your favorite freshman tight end, speed does matter. Using the previous generation of compact flash cards (Class 4), when I filled my camera’s buffer, I had to wait over 21 seconds for it to write all its data to the card. With Lexar’s 600X UDMA cards, that time was cut to less than 15 seconds. Afterwards, back at the computer, speed still played a difference. Lexar made a new series of card readers for the higher speed cards as well. Using Lexar’s new UDMA reader, my times were almost 50% faster downloading the same images to my hard drive, compared to using my old standard USB 2.0 card reader. If you haven’t bought any new cards recently, you owe it to yourself to look at Lexar’s UDMA and SDXC series of digital media. They are available on Lexar’s website and at most every professional camera store. A final suggestion – read the directions. Wait, don’t leave yet! I know, it’s heretical to think there are directions for a memory card. What foolishness, they don’t even pack directions in the package anymore. When you pack that much memory into such a small space, the chance for problems goes up as well. These few hints will serve you well in years to come – trust me!